Clerk-Recorder Hugh Nguyen will be moving his North County Branch Office in Fullerton to a new location in Anaheim in an effort to address increasing demand for services and also to offer expanded services. Clerk-Recorder Nguyen is looking to have the new office up and running in February 2019. The current North County Branch office in Fullerton has been in operation since February 2009. The office has provided the public important services such as issuing birth, death and marriage certificates, issuing marriage licenses, performing marriage ceremonies, document recording services, official records, and the filing of fictitious business name statements. However after nearly 10 years of service, the office has outgrown demand for services and its current location is no longer adequate. The new North County Branch Office will be located in the city of Anaheim at 222 South Harbor Blvd. which will double in size and cost less compared to the Fullerton location - saving tax payers money. The new office will offer the same services as the current location with the addition of passport services, expanded document recording services and will also feature two marriage ceremony rooms instead of one. The new location has dedicated free parking and is located close to Intestate 5 and State Route 91 for easy access. The department will post more information on its social media and its official website to keep the public informed during its transition from Fullerton to Anaheim. 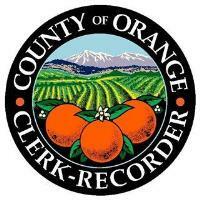 For more information about the services available at the Orange County Clerk-Recorder Department, please visit us at OCRecorder.com.